A clean computer is important for the health and well-being of your office staff. First of all, dirty computers and keyboards are a germy house, and the best defence against the spread of illnesses is to keep the germs washed away. The well being of the workers or students is enhanced by an uncluttered atmosphere. Using best cleaning practices helps control the spread of infections among building occupants. 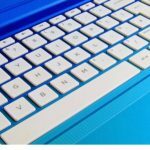 There are a number of ways that you can schedule your computer & keyboard cleaning routine. The first decision is how often you need the complete computer to be deep cleaned. 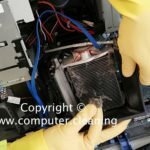 If you are a stickler for a clean PC or laptop, you have no choice but to clean all parts of the computer equipment every week. Remember, disinfectants typically require a dwell time. If the manufacturer’s directions aren’t followed, the product won’t work as promised. “At the end of the day, it turns into having employees educated about how diseases get spread from one person to another and what it takes to break that chain of infection,”. The workplace environment influences employees’ productivity, performance and well-being. No matter the industry, maintaining a clean workplace (that includes a clean computer, keyboard, and monitor screens) may help keep staff members safe, healthy and efficient. However, busy production schedules and increasing workloads may cause standards to dip. 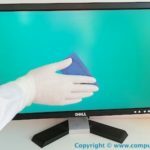 One thing is for sure; computer cleaning is one of the most important things that you need to think about if you are the person who is in charge at your office. With this being the case, it is vital that you stay on top of all of the things that need to be done. Because of this, you might find that it would help to think about the reasons that computer cleaning is so important. Computers store and process important data and information of your organisation. Durt and dust may block air circulation the CPU, motherboard, and circuit board of your computer. This may cause overheating or fire and can damage Hard disk drive of your computer or may cause complete failure of your machine. 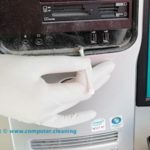 Regular cleaning and maintenance keep the computer hardware in good condition and prevent overheating and damage to the information it stores. Uncleaned computers are much likely prone to fire accidents. Fire can not only damage your computer but can cause harm to the people around it. For the health and safety reasons, it is recommended to deep cleaning your computer to avoid such risks. Personal hygiene and computer cleaning are not only important for good health, it is also essential for a person’s self-esteem. Hygiene and personal appearance were highlighted in the UK’s Department of Health online survey conducted in 2006 as factors in maintaining dignity for older people. Keeping in a routine is important as we age. Don’t feel like you have to give up going to the hairdresser or barber just because you reach a certain age. Looking good on the outside helps you feel good on the inside. Since laptop usage has been growing during past few years, the damages caused by spilling drinks on to the computers have become more often as well. An average laptop computer does not have extra covers to protect internal parts from getting soaked. Liquids cause the short circuit of important electronic components and they are really hard to recover afterwards. Hard drives are usually placed in a protective case and maybe still used after getting a little wet. However, harder soaking makes hard drives inaccessible, too. Sometimes the tiny details, like having sugar in coffee, may make a real difference. Do not let your life depend on such random things! Effective computer spring cleaning is therefore very important, so bringing in the best professional contract cleaners can be a particularly good idea. They have both the skills and the resources to ensure your computers and keyboards meet the cleaning standards you would expect and want to see in any professional organisation.